The Military-Family: Oh NO! 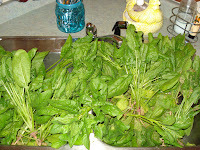 All my spinach plants matured today! Oh I'm so sad... rabbits seem to have eaten all of our spinich. /Hangs my head with tears pouring down/. Isn't a garden just so much fun!! ?